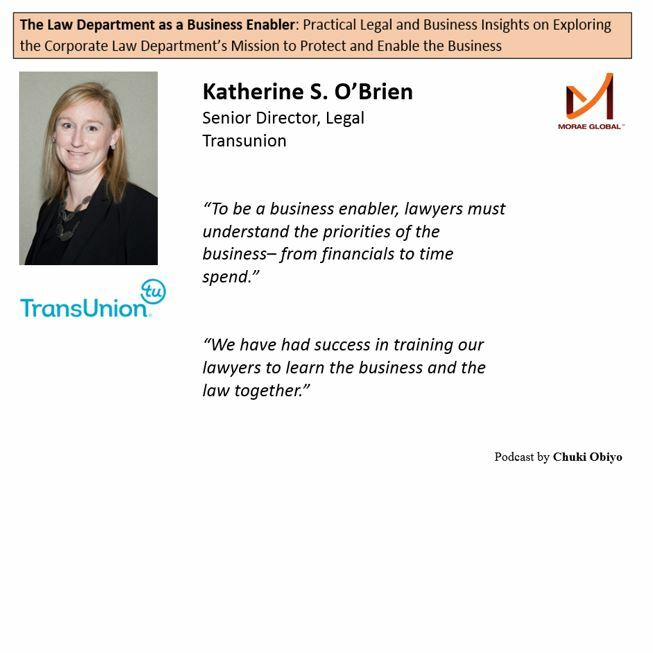 Katherine (Kate) O'Brien, Senior Director of Legal at TransUnion, joined Chuki Obiyo of Morae Global to discuss practical legal and business insights on the law department's mission to protect and enable the business. CHICAGO - Sept. 22, 2018 - PRLog -- Kate O'Brien, Senior Director of Legal at TransUnion, joined Chuki Obiyo of Morae Global to discuss practical legal and business insights on the law department's mission to protect and enable the business. "To be a business enabler, lawyers must understand the priorities of the business– from financials to time spend," says Kate. One of the key elements in establishing a good working relationship between the law department and the business is based on the organization's commitment to combine legal and business training on an ongoing basis. "We have had success in training our lawyers to learn the business and the law together". Kate and her colleagues are making progress on their objectives as a corporate legal function operating in a dynamic industry. Listen to Kate and Chuki discuss this progress and explore practical insights on what law departments need to get right— the right people, process, systems, and a business partner-approved scorecard?